It’s prayer and fasting week again tomorrow and I’m really excited to join Victory to corporately fast as a church. 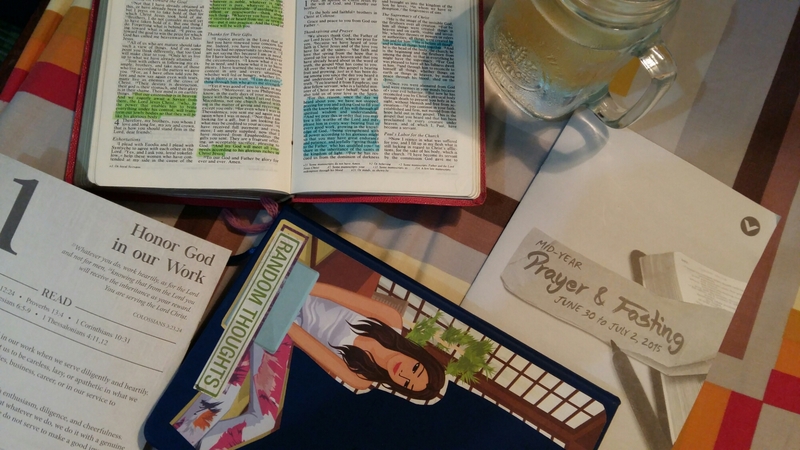 I admit it, fasting is not my favorite spiritual discipline, I only do this when there’s a corporate prayer and fasting in the church, and very rare, when I need to seek God, when I need to make big life decisions. I also do day social media fast last year every month, I’ve noticed how much time I spent in Instagram, Twitter and Pinterest, so I do fast, and spent some time prayer and read the Bible. Honestly, the first time I fast, I know that I want to seek God more, and hear from Him, but in my heart, I want my faith goals to be answered. There’s nothing wrong with that, God is pleased when we trust Him on things we’re believing for, but as I fast year-in, year-out, the meaning of fasting to me changes. Abstaining from food, and things that I crave for and replacing it with spending time with God, allowed me to know God more, and God faithfully reveals himself to me. Every year, the Lord made Himself known to me, I encountered the Lord personally, and those encounters strengthened and deepen my faith in Jesus. Though many of my faith goals was not fulfilled, the truth remains, Jesus is Lord, and He is good and faithful! Revelation of who God is to me…. Father. Lord. Healer. Provider. Comforter. Companion. Unlimited. Extra Ordinary. Sovereign. God who see. Owner of Everything. God of wisdom. Powerful. Captivating. Beautiful. Faithful. Source of strength. Great listener. Friend. Always available. Always on-time. He knows best. He has great plans (always better than ours). Generous God. Giver. Selfless God. God is Love. And I believe, there’s more! I’m excited for more of God in my life! Will I continue to fast? Yes, I will! Mark & I committed to continue fasting and make it a lifestyle (by God’s grace), and we will teach our future children to fast as well! As fasting creates hunger for God. Fasting makes us contented in life. That we’re so contented with God, and everything else are secondary! Fasting humbles us, every time we fast, we declare and express our great need for God, that we can’t do anything without God.